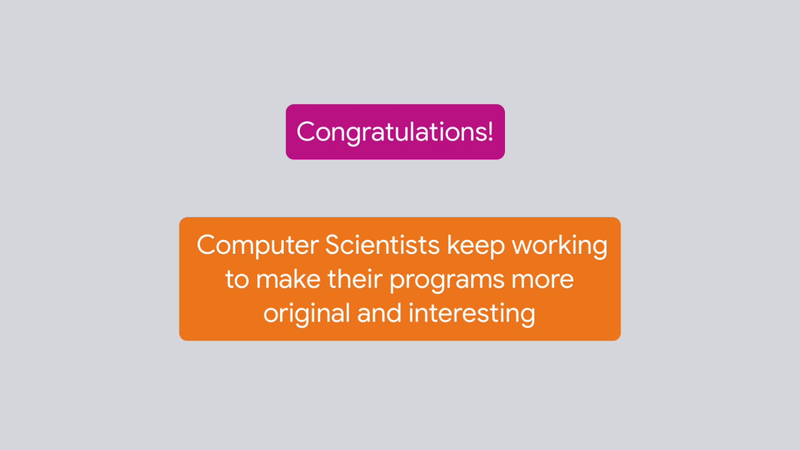 Congrats on coding today's computer science program. But the fun isn't over yet. Computer scientists often continue to work on projects after the basic programming is in place to make them more original and interesting. Now you get a chance to do the same with add-ons. This training class will explain the add-ons that you can choose to customize your program. In the Change Instrument and Tempo add-on, make a musical art piece change instruments and tempo when the yellow x bright touches different colors. In Make it Melodic with a Chord, make your project play chords, not just individual notes. Add another color to your art piece that plays a surprising sound when you touch an Easter Egg Surprise. In Sprite Trail, you will add a graphic effect that makes the yellow x bright look like it is leaving a color-changing trail as it moves across the screen. Change instruments and tempo in your musical art piece when the yellow X sprite touches different colors. Make your project play chords, not just individual notes. Add a surprise color to your art piece that plays an unexpected sound when touched. Add a graphic effect that makes the yellow X sprite leave a color-changing trail across the screen.